The Huffington Post gives its version of the road map. ... According to the experts at Spiel, it is good to learn how to handle criticism and the weight of reality. In order to get paid, people expect that you will have some working experience, and even if your portfolio is amazing, they might expect you accept an internship first before you can get a permanent position in the company. We're not big proponents of working for free, but many people do it as they struggle to get into the business. Lot's of striving artists ask TAG, "So what's the best way to get a job in the animation business?" The answer from the grizzled old union rep is a wee bit different than the one found on the Huffington Post, but neither route is wrong. The animation biz is ever-changing. There are feature-length cartoon studios where story artists, scenic designers and CG animators and technicians are employed inside four walls. There are studios where the front ends of half-hour animated shows get made. Their staffs consist of of script writers, storyboard artists, designers, timing directors, color stylists and animation checkerr. To get into any part of the biz, it's useful to own high-quality drawing and/or tech skills, a ferocious work ethic, a knack for working well with others and the patience of Job. The L.A. cartoon industry is bigger than it's ever been, but colleges and art schools are turning out graduates with animation degrees at a record clip and the competition is as fierce as it's ever been, so you need calling cards: a strong portfolio, a boffo student film, the ability to give good interviews, familiarity with Storyboard Pro and the willingness to take job tests that often go nowhere are just a few. To get into animation long-term you need. 2) The ability to do sustained, high quality work. It comes down to having the kind of job chops a studio is looking for, and to be standing at the door ready to go to work when they need you. Then, when you finally get the dream job, to have a talent for playing well with others so that you can keep the dream job. It's also good to know that nothing lasts forever. (Unless you're a staff member of The Simpsons). WB's Storks might be under-performing, but there's another animated movie that isn't. Your Name, Makoto Shinkai’s fantasy about two teenagers drawn together by gender-swapping dreams, has been seen by more than 8 million people since its release in August, beating the hugely popular Godzilla Resurgence to become the highest-grossing film in Japan this year, and the ninth highest of all time. It has earned more than 10bn yen (£77m) in box office receipts, an anime milestone previously achieved only by Miyazaki’s films. The lesson, at least in Japan, is that animation doesn't have to be CG to make a pile of yen at the box office. Hand-drawn features can also be high-grossers, but since very few are, very few get produced. Since its debut, “Adventure Time” has become a cult and critical favorite for its color animation, creative storytelling and quirky sense of humor. Among its many accolades are the show’s six Emmy Awards and a Peabody Award. Cartoon Network will have 142 half-hours in the tote bag when Adventure Time ends its run, and the network undoubtedly thinks there are now more than enough episodes to syndicate and re-run into infinity. For those keeping track, AT began life as a Nick project in collaboration with Fred Seibert's shop. But Nickelodeon decided the pilot wasn't there cup of entertainment, and let the produced short go into turn-around and Cartoon Network snapped it up ... much to Nick's subsequent sorrow. So here we are, eight years further on, as the series ends its long and triumphant run. Congratulations to Clay for having the talent (and stamina) to go where Frank Tashlin, Brad Bird, Rob Minkoff and several other animation artists have earlier ventured. (Mr. Kaytis also conducted a series of animation podcast in the not-so-long-ago. Find them here). It took a bit of time, but TAG has now compiled the data for wages in the last half of 2015 and first half of 2016. This year's data shows a wage decline in 27% of the Guild's job categories, and a hike in 73% of them. Many of the declines were small; the drop for CG lighters, to cite one example, was a whopping 71 cents. The 2015 and 2016 wage surveys can be found here. Feel free to burrow through the various numbers. The Animation Guild held its September Membership Meeting with a packed meeting hall. On the question: Shall the Animation Guild raise annual dues $100? (To be phased in over the next four years). -- the vote was a unanimous yes. Executive Board (11 board members) -- Jeanette Moreno King, Zack Atkinson, Lauren Hecht, Mike Morris, Phil Weinstein, Brandon Jarratt, Myoung Smith, David Chlystek, Spencer Knapp, Candice Stephenson, Dominic Polcino, Bronnie Barry, Cathy Jones, Kevin Moore, Andrew Jennings, Jason Mayer, Steve Kaplan, Lisa Anderson, Dave Thomas, Llyn Hunter, David Woo, J.J. Conway, Mark Banker, Bill Flores, David Shair. Ballots for the new slate of Guild officers will be mailed to the membership on October 11th, and ballots counted on November 12th. The new officers will be installed at the Guild's Executive Board meeting on December 6th. The Simpsons isn't the only cartoon series with two decades under its belt. In an effort to promote the 20th season, which premiered Sept. 14, mobile billboards have been placed in seven locations around the country depicting scenes that coincide with the trucks' placements. 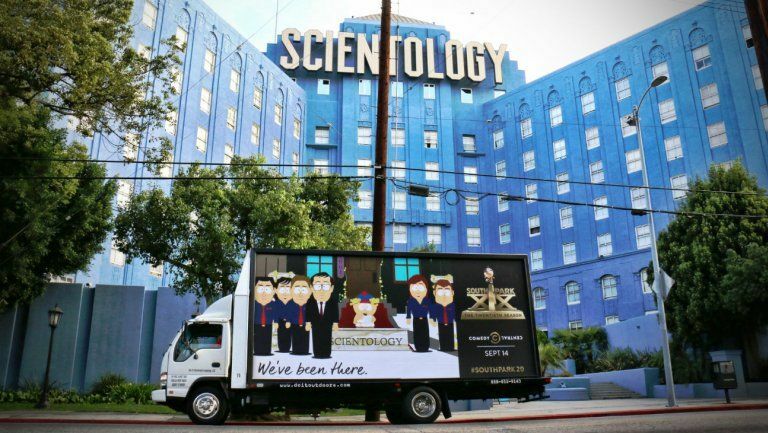 The marketing ploy did not go over so well with three locations: the White House, the Lincoln Memorial and the Church of Scientology. "We knew it was risky," Walter Levitt, chief marketing officer for Comedy Central told The Hollywood Reporter. "We knew some locations might not be pleased to have us out there, but we thought this is a perfect way to celebrate everything the series has covered in its 19 seasons." What keeps the show fresh is the topicality and envelope pushing. And the fact that it skewers various sacred cows at all points of the political compass, which endears it to cynical millenials, also near-millenials (you know, everyone up to about ... oh ... 59). If the show hasn't offended you on some level in the course of 19 seasons, then you probably don't have a pulse. And we would still like the production company to sign a Guild contract. What's startling about the motion pictures above is that all but one (The Mermaid) is an animated feature or super hero movie layered with animated visual effects. Think about this. In the history of moviemaking, animation has never been so dominant. Animated features sit at #2, #3, #4, #6, and #11. VFX extravaganzas occupy most of the rest. ... Ben Sherwood, the President of Disney-ABC Television Group, ... confirmed that there was development at Lucasfilm Animation at Disney XD regarding the next animated series set in a galaxy far, far away. Now some shuffling behind the scenes further confirms that some new Lucasfilm Animation projects are on the way, and with that also comes big changes at Star Wars Rebels. The Star Wars properties created at Cartoon Network? Under Guild contract. The cartoons made at Lucasfilm in northern California? Those, sadly, do not have the protection of a collective bargaining agreement, but there's no reason they have to continue that way. All it takes is a majority of representation cards. And sometimes a vote. ... I truly believe animation enters your brain differently. I am fascinated by that. It would be really interesting to keep picking at that. Animation comes at television or theater audiences by a separate route than live-action because people know what they're watching isn't real. Old-style live-action, on the other hand, was real. When you saw two characters fighting to the death, actual carbon-based life forms were flailing away at each other. When a squad of cavalry came thundering toward the camera, it was actual horses with actual human-type persons sitting atop them. And when you saw a man getting flung through a glass window, the window panes might have been spun sugar and balsa wood, but somebody was actually going through the damn window head first. All those things impact nerve endings differently than Wiley Coyote going through a window ... or falling off a cliff ... or shooting past Mars on the nose of a rocket. The perception of risk and danger are different. There's a subliminal realization that with analog live-action, actual events in the space-time continuum, staged and choreographed though the events may be, are actually happening. In the digital age, of course, it's different. When Captain America is duking it out with Ironman and knocking him the length of a football field, or Deadpool is jumping though the roof of a car from two hundred feet up, the action is so over the top and ludicrous, that nobody registers it as "live action" in the way that, say, the chariot races in the 1959 or 1926 versions of Ben Hur come across as flesh-and-blood occurrences: real people at real risk causing real sweat on the palms of audience members. (In the '26 edition, you look at a massive pile-up of chariots and know it's genuine; crew members in knickers are running out onto the track to tend to injured extras). Chariots plow into each other at 10:02. In 2016, much of live-action has become a cartoon, with gravity and physics distorted in ways similar to the world of Wiley and his Road Runner pal. But Mr. Bouchard strikes a chord about good storytelling connecting with audiences. Otherwise audiences wouldn't weep when the dwarfs gather around the funeral bier of Snow White ... or clench with fear when Woody, Buzz and the rest of the Toy Story troupe is swept toward the fires of a furnace. Are there differences between animation and live-action? Abso-freaking-lutely. But each has the capability to reach audiences. A Western remake and a new animated feature roll onto the big international list. 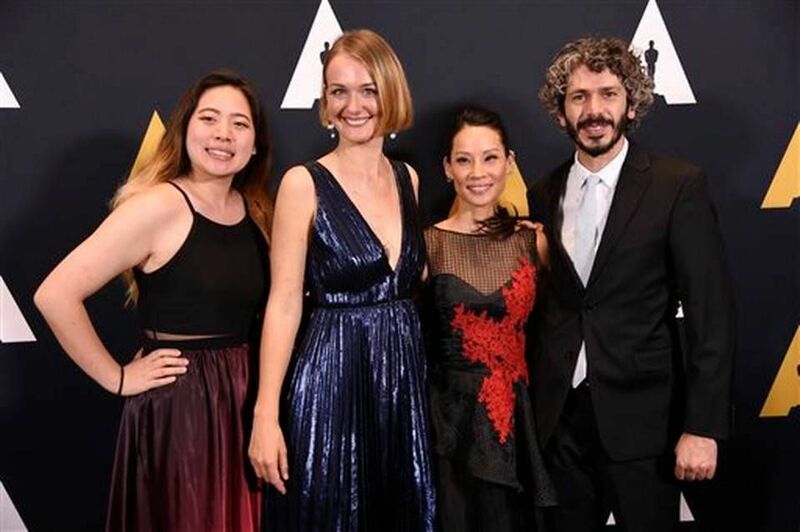 Silver award -- "The Wishgranter"
Left to right: Echo Wu, Alicja Jasina, Lucy Liu and Carter Boyce. Alicja Jasina accepting the Gold. Ringling student Echo Wu accepting the Silver. So remakes are still gold (with the right actors), but some animated features fly much lower than others. ... Storks opening is reminiscent of Sony’s Open Season which made $23.6M, earned an A- CinemaScore (which isn’t good for an animated movie when its opening is this low), had a similar cost to Storks of $85M, and did a 3.6x multiple with a final stateside take of $85.1M. Overseas was $112.2M. Though Open Season created a launchpad for animated pics in late September, property/cost/box office-wise, it didn’t warrant a theatrical sequel (just video), and that might be the case here with Storks. The fact that it skews way younger to the under 10 crowd, and is not a ‘five-quad’ animated film will slow its pace. If you’re a frosh toon brand, you have to have wide appeal if you’re going to be a studio cornerstone franchise. Walt Disney Productions animation division was on pins and needles about whether the production group was going to get shuttered or was going to continue. Rumors abounded. Rectums were tight. Then word came down that the animation department was still in business and the new guys (Eisner, Wells, Katzenberg) okayed opening a TV animation division. Michael Eisner came up with the idea for The Gummi Bears (okay, he wanted a cartoon developed around the candy) and the resulting series became Disney Television Animation's first hit. A lot of water has passed beneath Diz Co.'s bridge since those nerve-wracking days in the early eighties. It's good to see the place has prospered, even if most of the personnel at the studio in 1984 have moved on ... including Frank, Michael and Jeffrey. For some odd reason, a group of entertainment workers want improved wages and benefits. There's a lot of pushback right now from people who have to work for a living. When the standard of living slips year by year by year, folks working long hours in front of the flat screens commence taking action that will push the trend line in a different direction. ... Over the past three decades, the share of household wealth owned by the top 0.1% has increased from 7% to 22%. For the bottom 90% of families, a combination of rising debt, the collapse of the value of their assets during the financial crisis, and stagnant real wages have led to the erosion of wealth. So this union vote? A small step to alter the maldistribution at the base of the pyramid. For Warner Bros., Storks is the second film for the newly formed Warner Animation Group, which so far has only The LEGO Movie to its credit. Storks, of course, doesn't have the name recognition of LEGO so don't expect a $69 million opening, instead we're looking at titles such as Mr. Peabody & Sherman ($32.2m opening), Hotel Transylvania ($42.5m opening) and Rio ($39m opening) for comparison and, with Storks opening in 3,922 theaters, a $30 million weekend or just a bit more seems inevitable, the question is can it go any higher? "Sony Imageworks has enough Vancouver staff to do three features at once. There was a lot of communication between L.A. and Vancouver as the movie was made. You can do a lot of supervision over vide up-links. It's totally feasible to have production sites in different parts of the world and make the movie. It's a wave that's coming." The question is, however the production was done, will audiences like the story enough to flock to Storks? If the move hits $33 or $36 million on opening weekend, it will probably be viewed as a success. Artists, writers and technicians under TAG contracts receive pension and health benefits from the MPIPHP (Motion Picture Industry Pension and Health Plan). TAG has been getting an increasing number of calls from members asking, "So where are the Annual Reports? I need to know how my Individual Account Plan* and Defined Benefit Plan** are doing." The percentages above are not static. They can grow or shrink on direction from trustees of the MPIPHP. (Prior to the 2008 meltdown, the Plan's investment were more heavily weighted to fixed income. The financial experts saw at least some of the disaster coming, and shifted the Plan's portfolios to more conservative investments). * Individual Account Plan = a big basket of investments, directed by the MPIPHP, that earns interest and capital gains. ** Defined Benefit Plan = a monthly annuity (much like Social Security) that pays you X amount of dollars twelve times per year. The amount you receive is based on the total number of qualified pension years and total number of contribution hours in your account. Disney Channels Worldwide is set to launch interstitial programming designed to help kids lead healthy lives. Starting on Friday, animated shorts featuring characters from such series as The Lion Guard, Miles from Tomorrowland and Star Wars Rebels will start airing in rotation on Disney Channel, Disney XD and Disney Junior. Physical fitness and nutrition are good things. TAG has completed compilation of 2016 wage data and is in the process of formatting and laying out the info. 1) The continuing flow of new artists and technicians from universities and art schools to entry level animation positions with lower salaries. This tends to slow upward trajectories of other rates. 2) The desire of animation studios to keep wages as close to minimum contract rates as possible. Though there's been a record level of employment, 1990s-style bidding wars for artistic talent have not reemerged. As we all know, humankind can NEVER get enough animation. Sony is getting seriously involved in animated features. Probably because Sony is making money with them. The Animation Guild's fifth craft meeting took place Tuesday night in the Guild meeting hall at 1105 N. Hollywood Way in Burbank California. It was noted that TAG Vice President Earl Kress passed away five years ago yesterday at age 60. Earl was a prolific, talented writer who was instrumental in securing better conditions for freelance writers, negotiating health benefits for freelancers who wrote two half-hour outlines and scripts. New Media: There were discussions regarding the Guild's New Media sideletter (pp 99-113 of the CBA), how its production budget tiers are tied to live-action that don't reflect the budgets for animation. New Media will likely be a central issue in 2018 negotiations, and there will be early indications where New Media language is going when the WGA and DGA negotiate their contracts next year. Script Fees: Only one studio has script fees (payments on top of salaries); that studio is Nickelodeon. General Membership Meeting: Members were encouraged to attend the September 27th General Membership Meeting and run for the board or an officer position, since several officers and board members are departing. Bank of Hours: Why hasn't the Motion Picture Industry Health Plan's Bank of Hours been raised? Because the bargaining parties (AMPTP and IATSE) haven't negotiated a hike. The 450 hours has been in place for a number of years, though the threshold for health coverage was raised eight years ago from 300 hours to 400 hours per 6-month period. This had the effect of knocking some participants off the Plan and there was some anger from members about it. Five years ago, premium payments of $25/month for participants with one dependent and $50/month for participants with 2 or more dependents were introduced. Writer Categories: Animation Writer is a job classification in the contract. Story Editor in not in the contract, though the AMPTP told the Guild in negotiations four years ago it was part of the writer classification. Discussion of how story editors get paid: Some writer/story editors in attendance liked total fees divided over 26 episodes and being paid weekly, and didn't want the fees tied to a weekly salary because payments would be lower. It was noted that TAG negotiates wage floors, that individuals are free to negotiate better pay and conditions. Discussion about animation writers forming their own union. Mechanics of this are difficult, there would have to be de-certification then a new union created. There was also talk about making the Animation Guild into a national union that covers the whole country, the better to organize studios in Atlanta and elsewhere. Screen Credits: It was noted that the contract requires screen credits for story on features and half-hour broadcast "non-segmented" half-hour television shows. It was suggested that screen credits should be required for all lengths of programs, since screen credits trigger foreign levies. Storyboard artists should be allies with writers; where storyboard artists/writers and outline writers work together on non-scripted shows, they should share script fees. Production Schedules: Writers/producers and show runners need to insist on reasonable production schedules. Story editors need to do the math and build reasonable time lines for scripts (and storyboards). Many studios are using freelance writers, but some studios have staff writers. There's beginning to be more integration. DWA tv has staff story editors and small staffs of writers. Writers are in demand so studios are starting to employ staff writers to have their services full time. Writers who know what the board artists can do are more effective because they can write scripts that reflect what can be achieved on storyboards. “It will take us a couple more years” to hit that target, CFO David Wells says. “We’re a third to half way to where we want to be…We’ve got a ways to go” as the company looks for “a mixture of production models” — although not sports or ad-supported offerings. What's important to note here: Lots of Netflix original content is animation. The service wants to rope three-to-six year-olds into the wacky cartoons it has to offer with the expectation that the pre and elementary schoolers will stick around to consume adult fare as the years roll on. That's the theory, anyway. And Netflix is acting on it. (As is Amazon). Sony Pictures Animation is (and has been) kinda busy. Sony Pictures Animation is as busy as it's ever been. Smurfs: The Lost Village is finishing up, and Hotel Transylvania 3 awaits Genndy Tartakovsky to finish up Samurai Jack at Cartoon Network so that it can kick into high gear. (There might be some commuting back and forth for awhile). Most of Sony Imageworks is up in Vancouver, scarfing down the Free Money. But some Imageworks employees remain in Culver City, working on various projects. If schedules hold, the company will be releasing three animated project in '17 (Smurfs, Emojimovie and The Star, and two animated features and a hybrid the following year (Hotel Transylvania 3 the live-action animated hybrid Peter Rabbit, and Spiderman). In all the time Sony Pictures Animation has been open, its slates have never been this ambitious, but Sony animated features have been on a recent roll, with Hotel Transylvania 2 bringing in $473 million last year, bettering the original's grosses by over $100 million. So yeah. Sony Pictures Animation is working on a lot of projects. Not TAG, but the WGA west. The Animation Guild has nominations for a new slate of officers in a week's time, then elections that run until mid-November. TAG will also have a lot of newcomers, since multiple board members and four officers will be departing. The Emmys were on tonight, and yeah, we already know some of the them, but here they are again anyway (with the newbies). There is always a bajillion categories, but to each and every sinner (also too, the runners up) TAG blog offers sincere congratulations. The usual mix of genre titles, animated titles, and big studio movies with lots of animated effects. Kindly note that Ice Age: Collision Course, after making only a few small ripples in the United States, has cleaned up overseas. 85.2% of its take comes from abroad. This pretty well explains why Fox-Blue sky does one Ice Age picture after another. Mr. Katzenberg departed DreamWorks Animation just shy of a month ago. Why did he agree to exit after 22 years? Could it be the price was right? Sources close to Katzenberg say he’s intrigued by the model his longtime mentor, Barry Diller, has built. IAC, Diller’s conglomerate, owns everything from dating services like Match.com and Tinder to video sites like College Humor and Vimeo. How Katzenberg will put his own spin on that model remains to be seen. To J.K's credit, a decade ago he saw that smaller, stand-alone companies were spiraling down to extinction. He was interested in selling DWA not long after Pixar was snapped up by Diz Co. but the financial meltdown in 2009-2009 put an end to the possibility of a Pixar-sized sale. Years passed and the economy recovered, even as DreamWorks Animation hit a rough patch with a string of animated features that failed to turn a profit. (It's tough to survive on a business model that dictates creating nothing but theatrical blockbusters. The odds are high that this particular biz model will, sooner or later, fail). To the company's credit, it reacted to its movie under-performers by diversifying in multiple directions, by getting into television, amusement parks, and merchandise, and building a Chinese partnership. All of these strategies were steps in the right directions, but DreamWorks Animation was, at the end of the diversification, still a smallish company. And DreamWorks was likely to remain smallish. Given all that, Katzenberg's decision to cash in with a sale makes perfect sense. Better to take a bundle of cash and strike out in new directions than plow the same old fields in the hopes gold will sprout under your feet. Here's hoping Comcast-Universal does right by its new acquisition. The miracle on the Hudson continues to reside at the top of the heap. As happens from time to time, animation can under-perform at the box office. Kubo and the Two Strings has yet to break $50 million after five weeks of release, and The Wild Life, dead on arrival last weekend, looks to pick up $2.5 million at #8 in its second weekend of release. Every department is pretty much done except for lighting, which will be done with the last of its shots in a few weeks (the picture comes out at Thanksgiving). Crew members have been moving out of the big building at the end of the Burbank/Bob Hope runway was their jobs wrap up, returning to the Hat Building on Riverside Drive. Moana, from the looks of it, will be doing well. Because you can never have too much toonage. The new Blinky pic was directed by Deane Taylor and co-directed by Alexs Stadermann. The screenplay was written by Fin Edquist. BBTM currently tracks at 86% on Rotten Tomatoes, twenty points lower for audiences' "want to see". Come October, audiences will determine how the picture opens. ... And One More Feature Into Early Prep? So many animate features have done so well over the past few years (though some have flamed out) that our fine entertainment conglomerates are eager to step up and create more. This is a long way from the 1970s and 1980s, when long-form animation was shunned by big studios and left to Disney. Success at the box office turned earlier avoidance into passionate embraces. But some of these new features will fail, because failure is the lot of many movies, no matter how successful the segment in which they exist happens to be. So will see if all the hugs the majors now give animation turn less ardent as some movies come out and bomb. Netflix is so ... yesterday. Batman: The Animated Series producer/director Bruce Timm and writer/producer Paul Dini collaborated with OTOY’s artists and engineers on the VR project. The original voice cast of Kevin Conroy (Batman), Mark Hamill (The Joker) Loren Lester (Robin) and Tara Strong (Batgirl) also reprised their roles, with the guidance of Batman: The Animated Series voice director Andrea Romano. I've been told by more than one industry guru that virtual reality is the latest big Thing. Third Floor is working on a VR project; various animation studios are toying with it. So maybe the guru is right. Virtual Reality is what all the thirteen-year-olds will be doing (the hell with binge-watching on the computer flat screen!) in the next thirty-six months. Paris-based On Entertainment, the company behind recent feature-film release The Little Prince, says it plans to hire a staff of 300 over the next three years to run a new studio in Montréal, Québec. "Our new Montréal studio gives us a foothold in North America and provides us with the resources we need to ramp up production and extend our reach with films intended for international release," said On Entertainment co-founder Thierry Pasquet in a prepared statement. The company expects to ramp up production and release one animated feature every two years. Generous subsidies won't be going away anytime soon. They are now embedded into the fabric of Canada, the great state of Georgia, Britain, France, and to a somewhat more limited degree, California. "Tax subsidies are pretty well established in a lot of countries now, and a bunch of states. Georgia has a big subsidy program and they've done studies so they know the subsidy doesn't pay for itself, but they're all in. They've got studios and sound stages and they're going to keep on giving the money away. Because they want the industry to be there." And there you have it, our free enterprise system at its finest. "Pay us, and we will come. Otherwise we go to Montreal or Vancouver." TAG members at DreamWorks Animation tell us that no Guild jobs are impacted. These layoffs aren't a surprise. Restructuring is a fact of life in Tinsel Town. Disney (as was reported yesterday) is doing it, but the reality is that studio tweek, trim and reconfigure on an ongoing basis. No animation employee has to be reminded that her/his job is only viable until "end of project". After that it's off down the side walk in search of the next gig. That's simply reality in 21st century Hollywood. For live action and animation alike. Disney has trimmed approximately 5% of its consumer products and digital media staff in job cuts affecting 250 people, the company confirmed today through a spokesman. 50% of the cuts came from the company’s remaining video games-related workforce. Disney largely exited the video game publishing business in May in favor of a licensed games model, announcing the cancellation of its Disney Infinity line of interactive games and toys at that time. Several of the affected employees came from a team working on Marvel: Avengers Alliance in Bellevue, Washington. That series was cancelled last week. Layoffs at Diz Co. aren't limited to consumer products and digital work. Walt Disney Animation Studios is laying off dozens of staffers as Moana nears the end of production. Disney Television Animation is undergoing significant restructuring as more shows get outsourced to smaller Los Angeles animation studios and DTVA employees are shifted to various shows that remain in house. Disney is always shifting, tweaking, working to squeeze more profits out of its far-flung enterprises. Diz Do. isn't a Renaissance Art Studio, after all. It's a huge conglomerate trying to get huger. Review of First Year of 839 Contract: There was a discussion of collective bargaining agreement, how Tech Directors and CG animators are being impacted. At the feature studios (Disney and DreamWorks) overtime is being paid and there have been no major complaints. Production schedules are compressed, but opinions are divided on the negative impacts. Some people like the extra overtime pay; others would prefer more weekends and evenings spent with family. At tv animation studios – principally DreamWorks Animation TV -- more work is being piled onto leads and supervisors, with more job stress. For CG Classifications, there are no job descriptions and no clear parameters about what the jobs entail. This is a problem. Companies can reconfigure and redefine what a CG lead is, what a supervisor is, at a moment’s notice. There needs to be some controlling language in the CBA. Business Representative described the history of CG classifications getting into the contract in the mid-90s, when non-Guild tech directors working on “Dinosaur” at Disney agitated to be covered by the contract and to have pay rates track contract rates. At that time, numbered classifications were introduced. New Media: Studios are hiring artists and tech directors at below contract minimums (this is happening at IA locals covering live-action as well), but studios ARE paying the 6% Individual Account Plan pension percentage at the contractual minimum rate, not the actual rate of pay. The New Media Sideletter (Sideletter N – pp. 99-113 of 839 CBA) enables studios to negotiate freely below minimum rates. The budgetary tiers that would mean 85% of minimums would have to be paid reflect live-action budgets, and animation budgets are way lower so “budget tiers” in the Sideletter are never reached. This was an issue at the last negotiation, will be an issue at next IA and TAG negotiation in 2018. Simplifying Contract classifications: There was discussion of simplifying contract categories, keeping categories broad-based and simple and having fewer classifications and categories (Senior artist; jumior artist, apprentice artists, trainee). Some CG artists wanted definitions and more specific names in classifications. The Business Representative said that studios had resisted defining classifications in the past, that it might be more doable to get descriptive names in contract than definitions. There is also an additional concern at some jobs about the combination of different job classifications into one; some people have reported doing multiple jobs in the same deadline, whereas before they only had one. The issue there is that people are taking those jobs and not fighting against the job compressions. Wage Suppression Lawsuit: Individuals have gotten letters regarding the Wage Suppression class-action lawsuit involving Blue Sky Studios, Disney, DreamWorks Animation, Pixar, Sony Pictures Animation (etc). A number of attendees had received letters. Business Representative said that the Guild is not directly involved, although it held a meeting with one of the lawsuit attorneys and referred people to his law firm early in the process. Business Representative said he was subpoenaed for a depoition and that documents were also subpoenaed. It was noted that Blue Sky Studios and Sony Pictures Animation have reached settlements on the suit, but Disney, DreamWOrks and Pixar have not settled. Live-Streaming: Some artists thought that live-srtreaming was a viable way to involve members who could never get to General Membrship Meetings; others though meeting conversations need to stay in the meeting room. There was a worry that the streaming of meetings would keep people from speaking up. CG Classes at Guild: There was a discussion of reconfiguring the computer lab so that in-house classes could be held. Right now, CG classes are held off-site under the Contract Servicies Administration Trust Fund. What comes through at craft meetings to date? B) Interest in sharing work and wage information. Interest in building better employee in various studio departments. C) Desire to begin crafting possible proposals for 2018 contract negotiations. ... In 1982, G.I. Joe was brought out of retirement thanks to a brilliant marketing campaign executed with military precision. The Hasbro toyline had been defunct since the late '70s, with the American public soured on the military following the Vietnam War and the toys falling victim to rising oil prices that made 12-inch figures too expensive to manufacture. As Joe sat in retirement, Hasbro watched with envy as Star Wars toys made obscene amounts of money by trading off the emotional attachments children had to the film series' colorful characters. It gets lost in the mists of time, but the mid-eighties saw a resurgence of TV animation because of 1) Disney getting into the TV animation game (Gummi Bears!) and 2) TOYS. It wasn't just G.I. Joe. There was He-Man. There was She-Ra. Filmation, now a fading memory in the long history of cartoons, created hundreds of animated half-hours in support of plastic action figures that sold very well. It was noted at the time that the cartoon industry was becoming a sales tool for toy companies, but animation selling toys had been a long-term trend. True, the cartoons usually came first, then the toys. But honestly? Whether the doll came first ... or the theatrical short, was there really that much difference? What the tv cartoons of the eighties foretold was the total and complete marketing of product we all enjoy here in the 21st century. Today, we first get the multi-colored moments of animated entertainment on our flat screens and theater screens, then (two days later) the toys, apps, video games, lunch boxes and Christmas tree ornaments which are derived from that entertainment that we order from Amazon. Gwen Stefani and Nickelodeon are joining forces. The singer's animated series, Kuu Kuu Harajuku, is set to make its American debut on the Viacom-owned cable network, The Hollywood Reporter has learned. Inspired by the Harajuku girls that became a staple of Stefani's solo act in 2004, Kuu Kuu Harajuku is co-created and exec produced by the former No Doubt lead singer. The series first premiered in Australia in November 2015 after Stefani announced the series the year prior. A chip off the old Powerpuff. Several days ago we broke down jobs by classification. Now we'll break down employment by studios, largest to smallest. Understand when we get down to the micro-studios with a handful of employees, companies like "Made in Paradise, Inc." and "Daisy, Inc." we won't bother listing them. The only company on the list above that has been continuously under IATSE contract is Disney. There was a period of time when Warner Bros. went away, and every other corporate entity is new since Local 839's charter six-and-a-half decades ago. But even with Disney, labor contracts have changed. Disney Feature Animation (aka "Walt Disney Productions" in the great long-ago) was under an 839 contract from 1952 until the turn of this century, when an IA contract titled "TSL" (The Secret Lab, after the secret lab in The Emperor's New Groove) took precedence. Today, Local 839 (otherwise known as TAG) has a contract with Disney Television Animation, and the feature division has been rechristened Walt Disney Animation Studios and operates under the TSL contract, as does the remnants of the Disney Toon Studios. As for the rest, studios come and studios go. Warners, as noted above, ceased existing for several years then came back with a vengeance in the late eighties. There was Warner FEATURE Animation for a brief while, but that Warners division died after six years ... and now there is Warner Animation Group which concentrates on pre-production work for theatrical animated features (The Lego Movie) produced outside California. It should fit nicely with the other animated half-hours Fox offers on a Sunday night. Apparently animation is still a force at global turnstiles. In other animated news, The Wild Life, released domestically this very weekend, has delivered a paltry $3,400,00 stateside but has taken in $20,883,953 overseas. ... [Darkwing Duck] has its roots in DuckTales ... which featured an episode in which Launchpad is a secret agent called Double-O Duck. Disney executive Jeffrey Katzenberg liked that concept as a potential series and asked Stones to take a stab at it. Stones turned in a pitch trading off the James Bond theme, one he says lacked heart. He didn't believe in the pitch, and when Katzenberg rejected it, he was relieved … until the exec asked him to try again. The second time around, Stones got it right, injecting Silver Age comics nostalgia, and reconceiving its lead as a superhero instead of a secret agent (as late Bond producer Cubby Broccoli owned the rights to the Double-O name). Most importantly, he injected a healthy dose of heart thanks to the endearing relationship between Darkwing and his daughter. The DuckTales episode from which Tad Stones built the new series came from two Disney staff writers ... who got a little miffed when Disney TVA declined to honor a studio memo that promised a $10,0000 bonus to anybody who created a script that ultimately morphed into a network series, which this particular episode ultimately did. (And let's face facts squarely: ten grand is chickenfeed for a large, international conglomerate). The Animation Guild filed a grievance on the writers' behalf, and after several months of arbitration (some of which the division chief attended), the arbitrator awarded the scribes their ten grand. As far as anyone knows, the studio never used that particular arbitrator again, but at least the writers got the money the studio had promised. It's always a good thing to keep giant corporations honest. The new animated entry lands with a dull, squishy thud, but Tom Hanks remains potent at the box office. Yet even though The Wild Life perishes on impact, proving once more that Europe hasn't quite figured out how to make a global animated blockbuster, Kubo clings to #5 and Sausage Party down at the tenth spot, closes in on a $100 million domestic gross. Other animated pics that remain in at least some theaters? Ice Age: Collision Course has grossed $62,958,040; The Jungle Book has accumulated $363,891,757, and The Secret Life of Pets owns $360,575,775. Warner Bros. is in negotiations with Dax Shepard to co-direct their latest “Scooby-Doo” animated film with “Space Jam” helmer Tony Cervone. Charles Roven and Richard Suckle, who produced the last two “Scooby-Doo” live-action movies, will produce this as well. The studio has dated the film for Sept. 21, 2018. Since Mr. Shepard doesn't have a lot of background in cartoonland, Tony Cervone will probably act as guide through the thickets. It's not as if Mr. Shepard doesn't have directing experience. Just not with animators. Plus, Dan Povenmire is an executive producer on the pic. Mr. Povenmire also knows his way around a cartoon studio. Below we answer the question, classification by classification. Please keep in mind that we're only listing the groups with employment numbers above 94, and that these numbers and classifications are what several dozen studios of varying sizes send us via work-status reports. The classifications shown above represent 16.45% of all the Guild's contract categories. However, the other 83.55% of Guild positions (classifications such as "Final Checker" -- 2 individuals working, or "Color Modelist" -- 3 individuals working) have fewer than 95 people in any one of them, so ... as we say up top ... those numbers have been excluded*. And understand that the statistics above are data points in time. They could be larger next week, then smaller by December. But employment numbers have been steadily growing over the last 4-5 years, and it looks as though numbers will stay strong over the next 24 to 48 months. * You might be asking, "So why do 'Freelance Writers' get broken out?" Because it's the one category that has a "freelance" sub-group in the data. Why India stopped producing quality animation films? According to the collaborative Indian Media and Industry Report 2015 from Federation of Indian Chambers of Commerce Industry and KPMG, a Netherlands based auditing company, Chaar Sahibzaade (2014), a Harry Baweja computer-animated film, made with a budget of INR 200 million, generated a box-office revenue of over INR 650 million. India's track record with animated features has been decidedly spotty. The country has done reasonably well sub-contracting live-action visual effects work. And its efforts on behalf of Disney's home video products (The Tinkerbell series in particular) have been fruitful. But when the sub-contnent has turned its hand to theatrical product, there's been a number of fizzles. Disney partnered with Yash Raj films to present Roadside Romeo in 2008, but the picture bombed with both audiences and critics. Planes and Planes II, Disney Toon theatricals largely produced by Indian studios, did mediocre business at the global box office. Other CG theatricals have also under-performed. DreamWorks Animation has used Indian studios on some features with varying degrees of success. DWA staffers say that work on recent features has been pulled back to Glendale due to "quality issues". India has talented CG animators and tech directors, but studios down there are structured to get shots out quickly and inexpensively, not to nurture talent. It's doubtful that a moderately budgeted feature based on a moderately budgeted kiddie show will lift the animation industry to new heights, but maybe it's a case of "tiny steps for tiny feet." So in two days, America gets a real-time experiment in how animated features from the continent might fare stateside. The L.A. Times has some doubts. The pic is tracking "so so" on Rotten Tomatoes, but Lionsgate is rolling the pic out in 2200 theaters, so LG must be hoping for some action down-list from Clint Eastwood's Sully, which the smart money expects to open at #1 in the $25 million range. So the question, "Can Europe create an animated feature the world wants to see?" might get some kind of answer by Sunday. Next week the Guild holds its 401(k) Board of Trustees meeting; Vanguard has supplied fresh data, to wit:. The Plan started on a shoestring in 1995, and Disney employees were the first to get into it. Twenty-one years later, assets and participants grow at a steady clip, and it's become an important adjunct to guild members' Motion Picture Industry pensions. You'd better sit down for this. It seems that white men rule Hollywood. Animation is not much different than the live-action sector. Women have always been a small fragment of the creative part of the business, although when ink-and-paint was a studio department (instead of something shipped overseas) women dominated it ... and brought up female representation in cartoonland to 40-50%. But that was in the far-away past. In 2016, there is no ink and paint, and women make up 22% of the creative workfroce. This is low, but the percentages are moving in the right direction. Not too many years ago women were 19% of the total animation workforce. Wilma Baker, a Disney veteran who went back to animation's first Golden Age, passed away on September 4 at age 99. ... [Wilma Baker] was hired by Disney in 1937 as part of the final push to finish Snow White. As was standard procedure at the time, she entered the unpaid evening training program and was eventually judged good enough to be hired at $16.00 a week as a painter. In my interview she talks about the type of painting she was doing, including the use of transparent paint. She retired from Disney as head of Final Checking Department in 1983—she gets credit as a final checker on The Black Cauldron, which was released in 1985. Ms. Baker's first husband was Louis Sammon, who was killed during World War II. She returned to the Studio after the war as a young widow and mother, where she met her second husband, Ted Baker, a studio editor. After five decades in the animation industry (including Snow White and the Seven Dwarfs, Pinocchio, Bambi, and more than a half century later, Hunchback. she retired to Laguna Beach California in the 1990s.